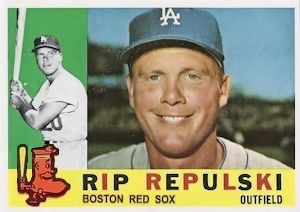 ON THIS DATE (May 10, 1960) ... Rip Repulski, a veteran who has traveled baseball's high roads and low roads for 14 seasons, was bought from the Los Angeles Dodgers yesterday. The veteran pinch hit and eight inning grand slam homer, that gave the Red Sox a 9 to 7 victory over the Chicago White Sox at Fenway Park today. Repulski came to bat in the last of the eighth with the score tied, the bases loaded, and one man down. He hit the second pitch off southpaw Don Ferrarese high into the net over the left field wall and put the Sox in the lead by a score of 9 to 5. But even the, the game had a further thrill for the fans, as the White Sox rallied in the top of the ninth inning, scored two runs on Sherm Lollar's two run homer off Mike Fornieles, and with one down, had the tying runs on second and third. But tall Tom Sturdivant trudged in from the Boston bullpen and made Jim Landis pop out, and then fanned big Ted Kluszewski for the final out to save the Sox victory. Repulski's homer was the first ball hit into the screen by the Sox all season and was the second grand slam of his career. The other was against Warren Spahn in Philadelphia.